There are 3 ferry routes operating between Menorca and Mallorca offering you combined total of 31 sailings per week. Corsica Sardinia Ferries operates 1 route, Mahon to Alcudia which runs 1 time weekly. Balearia operates 1 route, Ciutadella to Alcudia which runs 3 times daily. Trasmediterranea operates 2 routes, Ciutadella to Alcudia runs 8 times per week & Mahon to Palma about 1 time weekly. As the frequency and duration of crossings on some routes varies we would advise that you do a live search for crossings from Menorca to Mallorca to get the most up to date information. The heart and soul of the Balearics, Mallorca is the largest island of the archipelago, sitting just off the east coast of Spain. As islands go, Mallorca is a Mediterranean maestro, offering all that makes this part of Europe so enticing: mouth-watering cuisine, photogenic beaches and one of the most pleasant climates on the continent. Mallorca’s trump card, however, is the 550 kilometre coastline carving through the Balearic Sea, providing year-round fun for hikers, cyclists and tanning lovers alike. 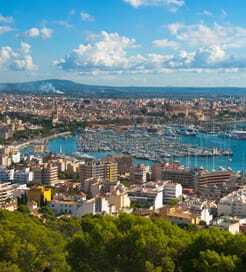 You’ll also find superb seafront restaurants around every corner and the capital, Palma, nestling in the namesake bay on the southwest coast. The relatively small city is known for its art galleries, lively bars and imposing Gothic cathedral, leading most to proclaim it as the most underrated city in Spain. As one of the most visited regions in Europe, the Balearics boast an impressive connection of ferry routes. Reaching Mallorca is particularly easy, with multiple sailings everyday from both the mainland and neighbouring islands.